i have a two month old german sheperd and we are feeding him royala canine starter, what i want to know is that feeding him only royal canine is enough or we have to feed it with any other food? 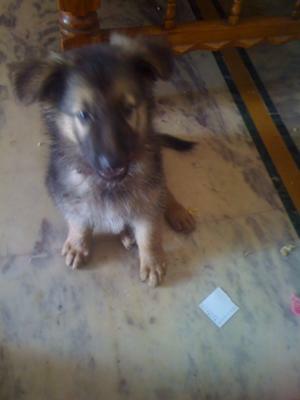 I'm mahesh, im from India, i have a 2 month old GSD,from the starting we are feeding him royal canine starter, i began to feel that it is not getting complete nutrition from only royal canine food, can you tell me are there any foods that can help my Gsd gain more weight ,if yes please give the names of that food. and also from the past few weeks it started to bite everyone, and can you tell me the ways to train it not to bite. To my knowledge Royal Canin is a pretty good brand of dog food - now I haven't read the label of the exact type of Royal Canin that you mentioned above but that might be something you'd want to check into. And if I were you I would also speak to your local veterinarian in your area and ask them for their suggestions on food choices for growing large breed puppies since the food that I have to choose from may be very different from what is offered in your area. Generally speaking, you don't have to have the most expensive dog foods and you don't have to use the Vet formulas that many veterinarians push but you do want to look for a food that you can always find locally, one that has meat as the 1st ingredient and if corn is an ingredient, which is the case in many, many dog foods, then at least make sure that it is way, way, way down on the list of ingredients. And concerning the biting, that is fairly common in growing puppies of any breed. If you're interested in why the puppy is biting then you might want to read more on puppy biting in general but, yes you're right, dog training is the answer to this problem. And I can suggest several online dog training courses that you might want to check out now if you want to do the dog training yourself, otherwise I would definitely suggest you sign you and your puppy up for a dog training class in your area if there is one. Good luck!